We are not alone. There are more than 7 Billion people on the planet with us right now. There are people in our homes, next door to us, across the street. We cross paths with people every day on the way to work, to school, to buy groceries. So why is it we can be in a room full of people and feel so alone? Researchers say it’s not the quantity, but the quality of our relationships that matters. It turns out that loneliness may be more dangerous than obesity, and an even higher risk-factor for early death than smoking. An AARP study of adults 45+ shows loneliness has doubled. 40% of adults in two surveys said they were lonely, up 20% from the 80’s. It turns out we need to be known. “Our very health and well being depend on our ability to form and maintain satisfying social connections with one another,” says researcher and author of Loneliness, John T. Cacioppo. Isolation, loneliness, and discouragement can cause us to lose hope. In her recent “Crash the Chatterbox” sermon, Holly Furtick referenced the story of Leah and pointed to 6 ways we can conquer discouragement in our lives. She talks about choosing to praise – even when we don’t feel like it. This weekend at Elevation Church, we’ll be announcing some of our new outreach initiatives. One of them is a focus on seniors. We believe we have an opportunity and responsibility to lift up and encourage our elderly neighbors. Together we’ll be working with our current outreach partners like Hands on Charlotte and new ones like Blessed Assurance to spark and nurture new relationships with older friends. Together, we can help others find their hope – thereby renewing our own. Enjoy this extended version of Hillsong’s “With Everything” and let your hope, rise. Tell me what brings you hope – and let me know how I can pray for you. Hillsong – With Everything from With Everything on Vimeo. It’s no longer Friday – but I promised myself I’d be intentional about blogging in 2014 – so here’s my #FMFParty (Five-minute Friday) thoughts on Lisa-Jo Baker‘s “crowd” prompt. My wonderful husband in 2013 challenged our family to recognize the sabbath on Fridays. Since we’re blessed to be on staff at Elevation Church together, it’s our best day to spend together as a family, reflecting on God’s glory and goodness without distraction. But it’s not easy for me to unplug. shut down. ignore the texts, emails, deadlines, and phone calls that ping at me all day. So Sean takes my phone away. Seriously. He read a book called 24/6 in late 2012 that inspired his leading our family to “remember the sabbath.” It’s the only commandment that begins with “remember” says author/physician Matthew Sleeth – “it’s almost as if God knew we’d forget,” he says. So on Fridays, when I could be spending time with friends, neighbors, coworkers or colleagues – I’m at home, spending time reading and playing baseball and board games with my family. We talk, we play, we get messy, we laugh. We don’t go anywhere. It’s weird, really. But I like it. I used to use Fridays to get caught up on everything I didn’t get done the rest of the week – cleaning, writing, answering calls/emails, and all manner of working. On Fridays, my crowd is my family. And it’s just right. My super-woman sister reminded me this weekend about how our father taught us NEVER to use the word, “can’t.” It’s not a word he would say. We don’t use that word in this house. You CAN. The trouble was my father would use plenty of other words (other than can’t) in our house that seemed just fine. The four-letter kind I learned to utter in my own frustration. This and other crazy things that happened in my house growing up led me to constantly question, “Does my father really love me?” .. because the words and the actions didn’t always match up. Of course I knew my earthly father loved me, the best way he knew how. I’m so grateful for how he gave me so much. But I’m learning now that his imperfect love led to a lot of confusion in my little girl heart. My dad was bullied and beat up as a young boy. So he learned to raise his fist at the world and with a long list of curse words say, “YES – I – CAN!” He was determined to live. To survive. To prove those guys wrong. No matter how imperfect my dad was, I always admired his determination. But like any good human quality like passion, intelligence, confidence, and even courage – if we’re not rooted in the right place we will find these qualities can only get us so far. And I’m finding, they can actually keep us from the life God wants for us. I’m grateful for the opportunity to be under the teaching of the best of the best. Pastor Steven Furtick’s book Crash the Chatterbox is a must-have for anyone who’s ever struggled with the lies of insecurity, fear, condemnation, or discouragement. This past weekend at Elevation, his wife and my friend Holly Furtick preached an incredibly practical message on discouragement I know I’ll go back to again and again. Through this consistent teaching, and studying God’s word on my own, I’m learning how instead of overcoming my fears through Christ’s power IN me, I’ve been consistently denying my fears and pushing past them in my own strength. And with two little boys and a husband and a rewarding ministry and demanding schedule – my strength is a limited resource. Today, I’m learning how to move from being determined (in my own strength) to being devoted to the one whose resources are unlimited. Thank you, Jesus for this day. I am a limited being. I can’t do everything in front of me today on my own. But your word says that IN YOU I can. I have to be smart, Jesus – I can’t say YES today to everything that’s placed in front of me, so I ask that you’d sift the work of my hands. Help me to discern what tasks are mine alone God – which ones I can delegate to others on this journey with me – and which ones I should push aside for another day. More than anything God today I want to know you better, and be devoted to you. I trust that as I devote my life to you, your love will overflow through me so I can bring YOUR peace, YOUR joy, and YOUR love to those around me. Thank you for first loving me. Amen. My sweet mama from Spokane says I started talking in full sentences at 8 months of age and never stopped. Speaking was never a problem. Listening has always been a problem. I’ve got words, baby. Plenty of them. And they’ve gotten my in trouble plenty of times. Like that time I pulled over at the start-finish line and told the flagman what I really thought of his abilities. Or that time I told my boss what I really thought about his criticism. And so on. And so on. My dad used to say, “Remember to put your brain in gear before putting your mouth in motion.” I remember him telling me that maybe a dozen times. Quick to listen. Slow to speak. Seems like maybe I’ve had it turned around for awhile. I’ve always admired good listeners. I’ve decided I want to be more like that. Today I will breathe more. Why can’t I make them happy? I am far too easily distracted. Do you have this problem, too or is it just me? And many of these distractions come because I have trouble discerning the difference between what is my business, and what is God’s. Recently, I told our spring 2014 class of Elevation Church Interns about a dangerous prayer I often pray. It is, “God, show me someone to love for you today.” It’s dangerous because God is so faithful. And it helps me notice the people who need a touch of his presence in their lives. But sometimes I find myself getting in the way of what he wants to do. It doesn’t mean we choose not to care. It doesn’t mean we don’t give to worthy causes, or give when someone has an immediate need that God has given us the opportunity to meet. We should do these things. It also means we should pray and be with people who are suffering. But as I learned in the Nuba mountains of Sudan, when people are in desperate need – the only thing of value I really have to offer personally, is Jesus. Frustrations of a Fixer, You be Jesus – Let God be God. If you’re interested, these are a couple great books that have helped us frame our strategies in Elevation Outreach – Toxic Charity and When Helping Hurts. And for more on the work we got to do together through Elevation Outreach in East Africa watch our 2013 documentary, Beyond the Banner. 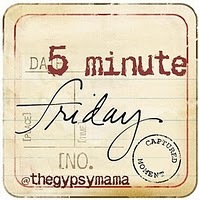 In my first attempt at five-minute Friday I’ve picked a way-too-big topic. Grace is waking up in the morning. … the running-me-down hugs my Asher gives me. … clean, drinkable running water. … an unsolicited, “I love you Mommy” from my Cooper. … a kind word from a friend. … a good doctor’s report. … a paycheck WITH health benefits. … my beautiful savior loving me even when I’m being a spoiled, selfish brat. … choosing to overlook an offense. For one more minute – a quick thought on number 10. My friend Lysa TerKeurst writes, “He who holds the tongue holds the power.” I find that to be a beautiful and frustrating paradox. I see that I have the power to CHOOSE GRACE in situations where I could fly off the handle and be all messed up and offended. I’m working on choosing grace daily. I’m making imperfect progress. And I’m grateful for Jesus’ example. What are you choosing today?